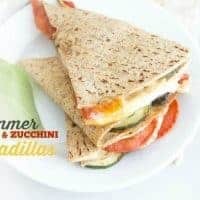 These super simple summer-inspired quesadillas come together in a matter of minutes, making a great snack, lunch, or even a meat-free dinner when you’re running low on time. Don’t you just hate when you go on vacation with no cares in the world and have to come back to reality? It’s absolutely the worst! That was me last week. And with spring break happening all over, I have a feeling that it’s about to be yours as well. But don’t you worry – I have the solution for you! Last week, the kiddo was with his dad and we dropped the fur-toddler off with the fur-sitter, and we went on a little getaway down to gorgeous southern Utah. We slept in late. We drank a lot of coffee by the pool. We played in the red rocks. We went on an impromptu roller-blading ride. 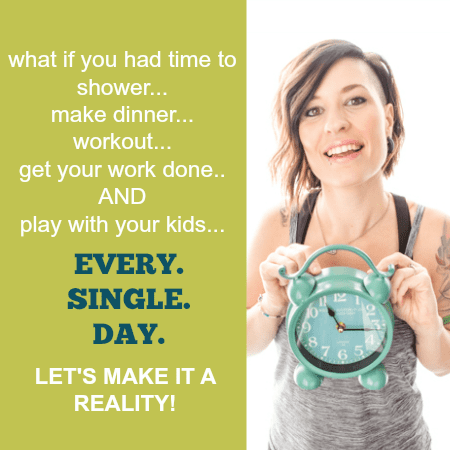 Best of all – We didn’t make a single dinner! Wednesday morning hit, and we packed up and started heading home. We got back just in time to pick up the kiddo from school. And just like that, we had to get back into it. There was no transition period to be had. No weekend to recover from the long weekend. As far as the kiddo was concerned, it was just another day. Thankfully, there were still some salvageable items in the fridge from before we left, and I was able to throw something together, topping it off with the basil growing in my windowsill. Paired it up with some grapes from our little trip getaway, and I called it a win. Kiddo had no idea I was scrambling with these tasty quesadillas. 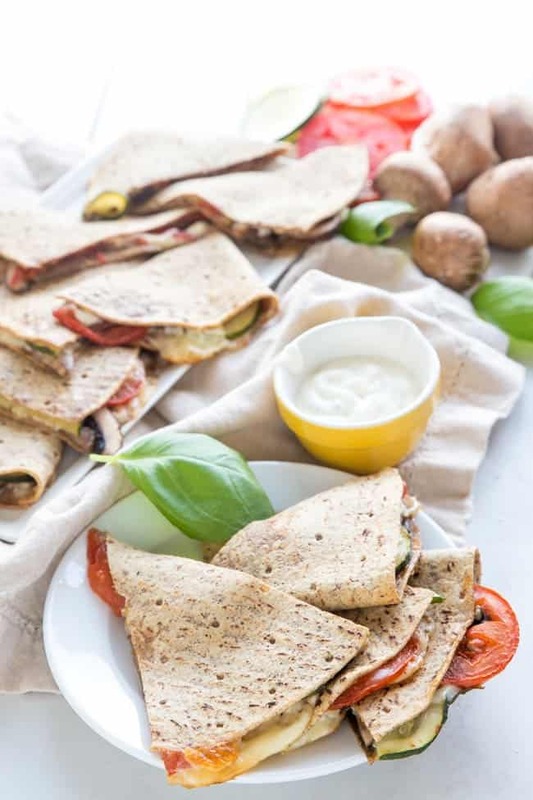 Whip these up next time you’re short on time or just need a quick and healthy snack to get you through the day. 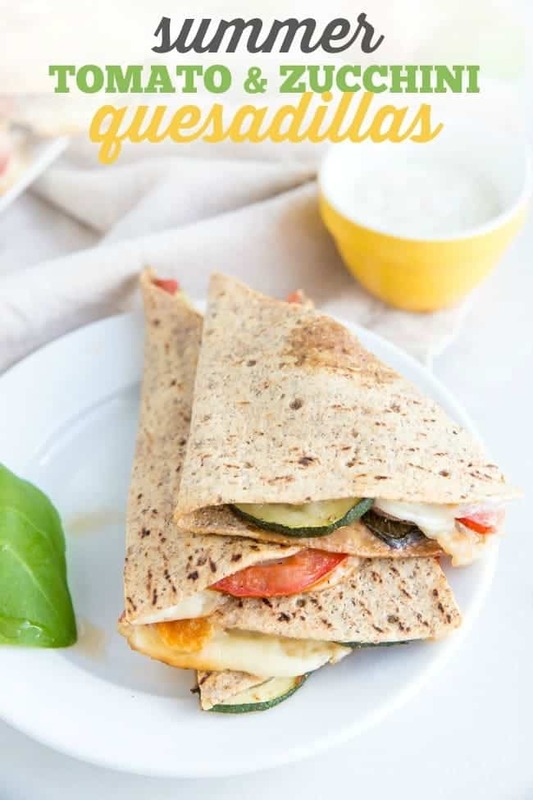 OR if you’re feeling adventurous, the pumpkin quesadilla is for you! 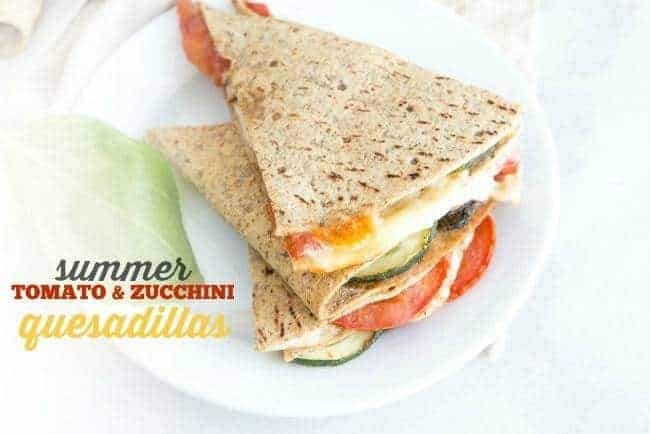 Summer staples become a 10-minute dinner with this healthy recipe. 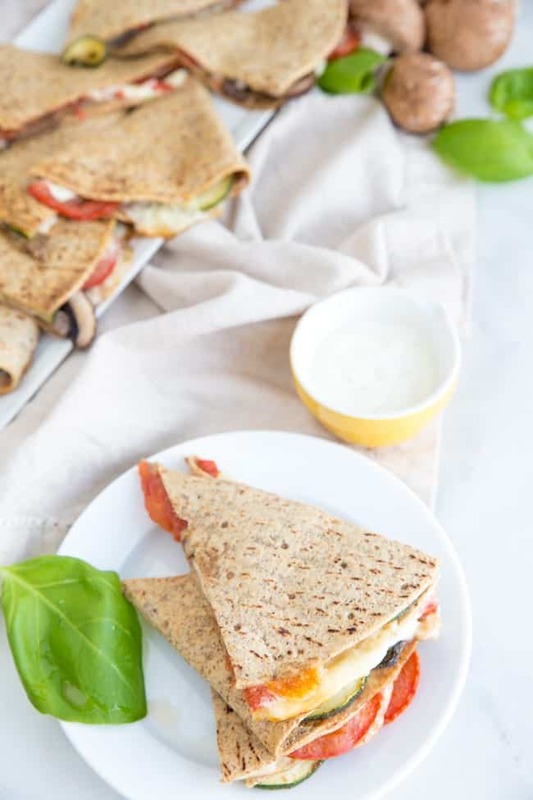 These super simple summer-inspired quesadillas come together in a matter of minutes, making a great snack, lunch, or even a meat-free dinner when you're running low on time. 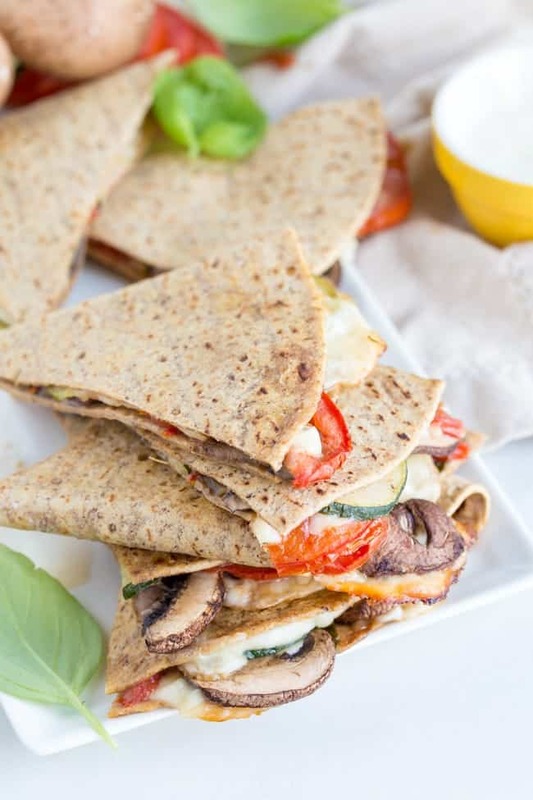 Divide tomatoes, zucchini, mushrooms, basil, and cheese among 3 tortillas, being sure to fill to the edges. 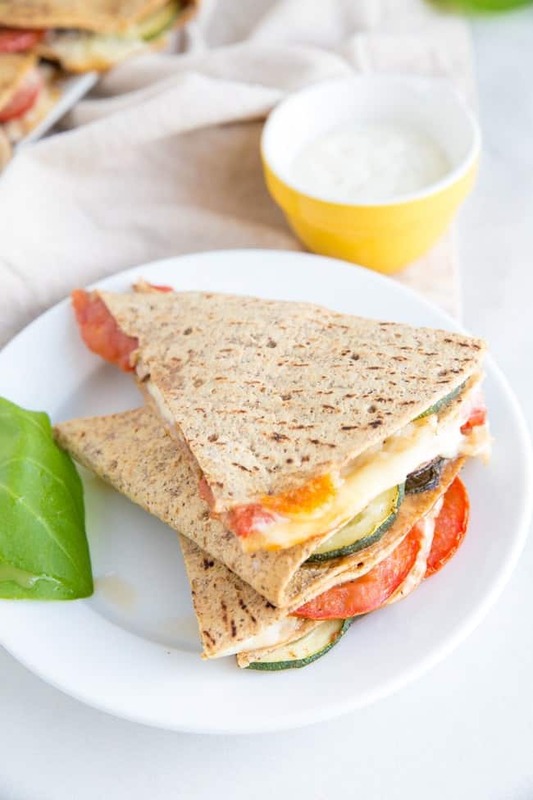 I like to put a little cheese on first before all the veggies as well as on top of the veggies, ensuring that everything melts and comes together. Top with remaining tortillas. Serve right away with your favorite salsa, ranch dressing, hummus, bbq, or avocado sauce. 1. I like to use a large griddle that covers the span of 2 burners on my oven. That way, I can cook all quesadillas at the same time rather than only being able to fit one or two at a time in a skillet. 2. 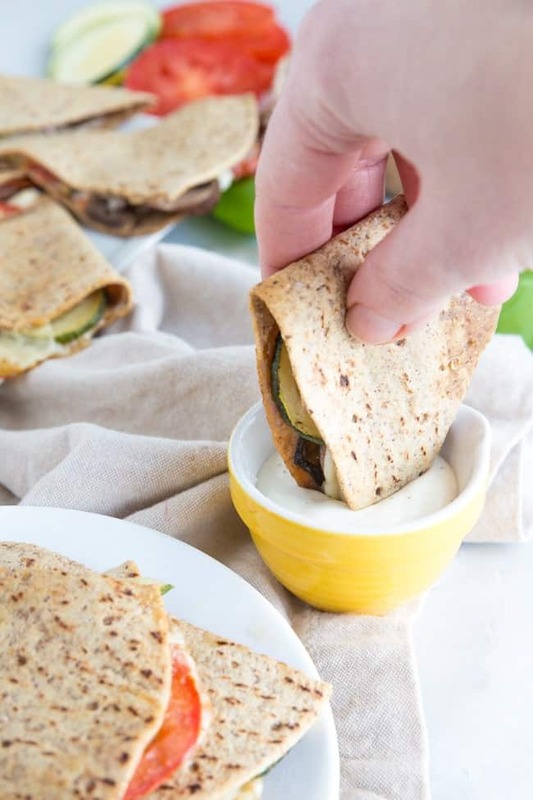 Alternatively, you can place ingredients on half of each tortilla and fold it over, creating 6 half-tortilla-sized quesadillas. This makes flipping much easier to manage.